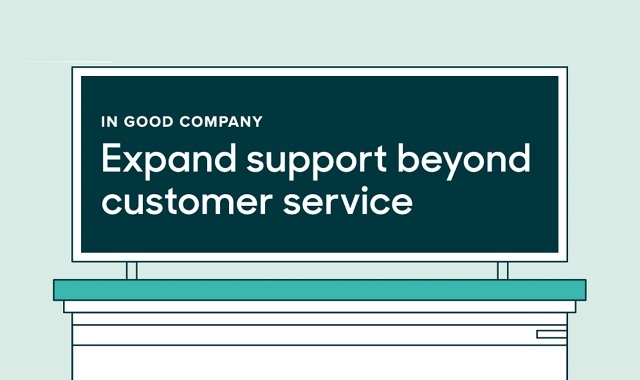 In good company: Expand support beyond customer service #infographic ~ Visualistan '+g+"
Supporting today’s customers requires an “all hands on deck” approach. Customer service is no longer siloed from the rest of the company—or at least it shouldn’t be. Today, customer service is more proactive, engaging, and transparent than ever before and providing that kind of support requires input and assistance from other customer-facing teams. Whether it’s sales, billing, professional services, customer success, marketing, or a product development team, each team has a hand in interacting with the customer, and the more you can capture all those interactions in the same place, the more cohesive the customer experience.